Seizures are frightening not only to the dog having the seizure attacks, but to the owner as well. 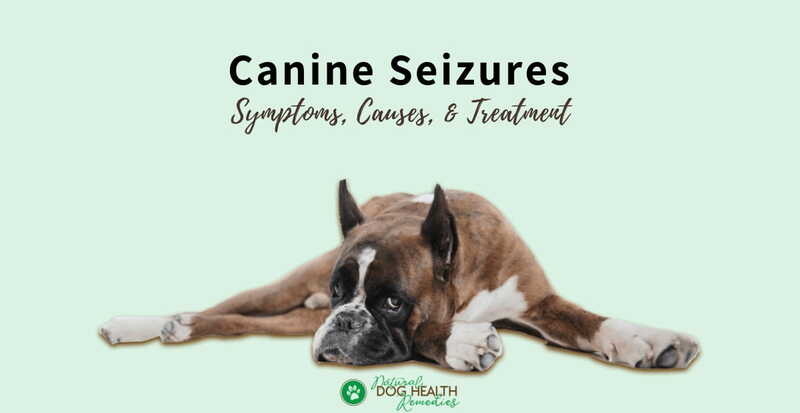 If your dog unfortunately has problems with seizures, be sure to consult a veterinarian to see if the seizures are caused by an underlying health issue. If so, and when the underlying cause is addressed and dealt with, the dog will no longer suffer from seizures. Additionally, according to some veterinarians, a dog being constantly choked by a neck collar can develop seizures. The reason is that, the first cervical vertebra (C1) in dogs articulates with the brain stem. If the neck is choked by a collar, there will be increased pressure in C1 which puts increased pressure on the brain stem. This can lead to a seizure. Therefore, choke collars can pose a danger to puppies and dogs. Also, if you tether your dog outside most of the day, use a harness instead of a collar to prevent your dog from running out the length of the leash and being choked by the collar. 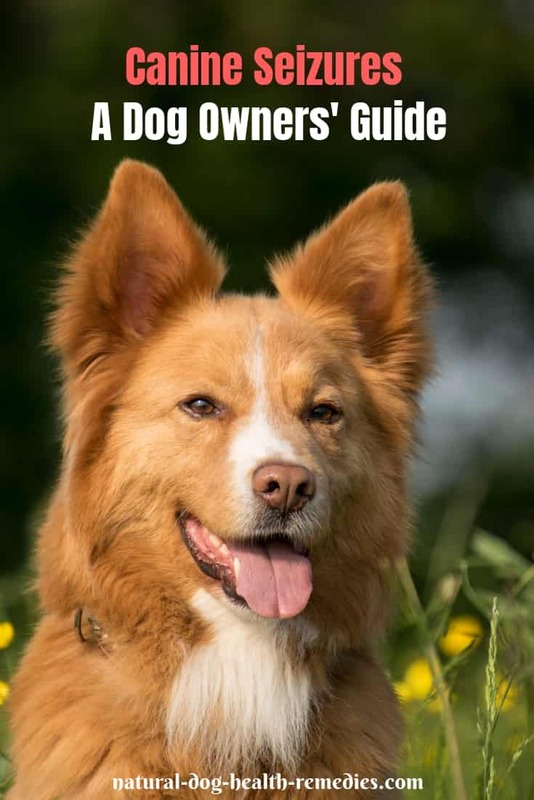 According to Dr. J. Symes, a veterinarian who has spent a great deal of time researching the relationship between glutens and canine illnesses, idiopathic epilepsy in some dogs may be caused by gluten intolerance (celiac disease). Be sure to visit this page for more information. Do not try to restrain the movement of a dog in seizure since he may injure himself during violent convulsion if he cannot move freely. Keep your hand away from the dog's mouth to avoid being bitten inadvertently by the dog. Protect the dog's head from hard or sharp objects by removing the objects if possible. Try speaking to the dog softly to ease his fear and anxiety. Do not give the dog any pills or liquid in the mouth as he will choke on them. Dog seizures can be generalized, focal, or psychomotor. Generalized seizures are the most common in dogs. Pre-ictal: This state happens before the actual seizure itself. A dog in this state usually has some noticeable changes in his behavior. For example, the dog will become anxious and restless, and he may look worried or scared. Ictus: This is the actual seizure, which may last for only a few seconds but could last up to a few minutes. The seizure usually consists of two phases - the "tonic" phase and the "clonic" phase. In the "tonic" phase, the dog becomes unconscious and collapses with rigidly extended limbs. This may last for 10-30 seconds. Then the "clonic" phase begins with a "running or paddling in place" motion, sometimes accompanied by drooling, chomping, or chewing. The dog may also lose control of his bowels. Post-Ictal: This is the state when the dog regains consciousness but remains disoriented. He may stumble into a wall or walk into furniture. This state may last for minutes or even hours. Also known as "focal motor seizures", this type of seizures is similar to generalized seizures but involves only one area of the dog's body, e.g. a limb, or one side of the dog's face may be affected. A seizure may start off as a focal seizure and progress into a generalized one. This type of seizures causes a dog to behave abnormally, such as running around hysterically, "fly-biting", chasing his tail, etc. Since a dog having a psychomotor seizure is fully conscious, it may not be easy to tell if the dog is having a seizure or if he is just being silly. But if the abnormal behavior is the same every time, then you can be pretty sure that the dog is suffering from psychomotor seizures. Can a Seizure Kill a Dog? Generally speaking, seizures that last for only a few seconds do not cause any permanent brain damage, and will not kill a dog. However, when a seizure lasts for over a few minutes, the dog's body temperature will begin to increase. Sometimes the temperature could reach as high as 43°C (110°F). In such a case, the dog may suffer from complications, such as a heat stroke or brain damage. So while a seizure itself may not be able to kill a dog, the complications as a result of a prolonged seizure could be fatal. Many dog parents also wonder if seizures are painful. As frightening as they may look, seizures do not cause any pain to dogs. During a generalized seizure, the dog is unconscious and doesn't feel anything. Dogs having focal seizures may feel confused, but not pain. If the seizures are short, mild, and infrequent, your dog may not have to take any medication. In fact, there is a "2015 ACVIM Consensus Statement on Seizure Management in Dogs" stating that drug therapy should not be recommended if a seizure is mild and infrequent. On the other hand, if your dog has more than one generalized seizure a month, your vet will likely to prescribe an anticonvulsant drug, and conduct tests to try to identify if there is a root cause. Phenobarbital is perhaps the most commonly prescribed medication for dog seizures. It is usually given two times daily, and should not be stopped abruptly as this may trigger more seizures! Side effects of phenobarbital are rare but may sometimes occur in some dogs, which include increased thirst, urination, and appetite. Sometimes potassium bromide is given in combination with, or in place of, phenobarbital for dogs who do not respond well to phenobarbital. This drug can cause sedation and may lead to pancreatitis and/or toxicity in dogs. As such, nowadays, it is being replaced by newer medications and is gradually being used less frequently. Newer drugs on the market for dog seizures include Primidone, Levetiracetam, and Zonisamide. Levetiracetam seems to be effective in treating seizures in dogs and have few side effects. Primidone is not as effective (as Pheno) and there is no advantage to choose this drug over others such as Pheno. There are few studies on the effectiveness of Zonisamide. However, it has known side effects such as sedation, appetite loss, and may also potentially cause liver and urinary problems. In addition to conventional treatment, consider using natural seizure remedies (e.g. herbs, dietary change and supplements, etc.) to help manage and control the condition. Watching a dog having a seizure could be extremely traumatic to dog parents, but most of the time, dog seizures can be managed using anticonvulsant drugs (and remedies), and dietary changes. Seizures do not shorten a dog's life span, and with proper management, a dog with seizures can live a relatively normal and happy life. Consider giving the herb milk thistle to your dog if he is on phenobarbital to help support his liver.